It was a great and tremendous joy as IPOB Delta State inaugurates' Amoji Zone 1, in Amoji Obulu, Onicha Ukwani Delta State, Biafraland. Biafrans from this region really turned up zealously for the unfettered restoration of the sovereign nation of Biafra, declaring the community as indigenous to Biafra and not Nigeria. Furthermore, the newly inaugurated IPOB family unit members narrated their ordeal in the hands of Hausa Fulani men and cow rearers in the community. One of them who spoke with Family Writers Press correspondent at the inauguration ground lamented bitterly, how they are constantly massacred, slaughtered and always intimidated by foreigners known as Fulani herdsmen without any Nigerian media reporting the plight of the people to the general public. Many others who were privileged to speak with the journalist explained why they must be part and parcel of the struggle for the restoration of the sovereign nation of Biafra which they are indigenous to. Another indigen who spoke with this media correspondent made this statement: "We have oil in our land but we are dying of starvation, we live in mud houses while, Hausa Fulani are drilling the oil and taking our other resources free of charge and still oppress us, the owners of the wealth. Why wouldn't we agitate for a better life in Biafra to stop these constant sufferings and slavery in the hand of those whose culture is alien to ours?" 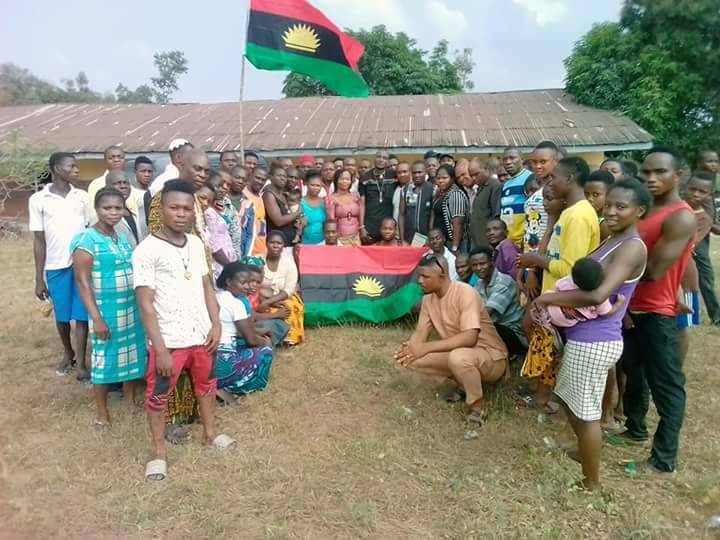 The people of Amoji community stood on their ground and pledged full support for Biafra and the upcoming Republic of Biafra referendum saying Biafra freedom is inevitable, unchallengeable, unquestionable and unstoppable under the leadership of Mazi Nnamdi Kanu the supreme leader of the Indigenous People Of Biafra (IPOB). However, the Nigerian government should stop wasting their time on a mission that can never be accomplished (which is trying to hinder Biafra from emerging as a republic). With great evidences, people's constant call for referendum and their overwhelming support for Biafra, shows that Biafra is already here. The men, women, youths and children are fully aware that Nigeria is not their identity but sees and knows Biafra as their true identity and remedy to many years of sufferings, pains, marginalization in Nigeria and also the only way to emancipate oneself from mental slavery and subterfuge. Finally, on behalf of Family Writers Press, I enjoin the people of Amoji as they have stepped out en-mass and pledged support for Biafra and unalloyed loyalty to the supreme leader of IPOB, Mazi Nnamdi Kanu, to continue spreading the gospel and truth about Biafra around the community and nearby towns till the last day when Biafra shall be officially declared as an independent nation.